Procurement for controlling cost - the cure or the affliction? Procurement is the acquisition of goods and/or services at the best possible total cost of ownership, in the right quality and quantity, at the right time, in the right place and from the right source for the direct benefit or use of corporations, individuals, or even governments. Taken in this light, who could argue that procurement doesn't serve a vital role in the conduct of business? Too often, alas, procurement draws fair criticism as the business function that values cost savings over long-term relationships; that reduces all goods and services, no matter how value-added, to commodities which can be differentiated on price alone; and that relies on negotiating tactics one can imagine being employed by Attila the Hun when dealing with vanquished foes. But these are epithets we typically direct toward the procurement managers negotiating the value of the services we offer. How dare our client's procurement manager not recognize the clear distinction between what we offer and the sub-standard offering of our inferior competitors. On the other hand, when we're negotiating with our suppliers, those charlatans who try to drain away our hard-earned profits, then by all means our own procurement manager needs to take an aggressive negotiating stance to protect our business. Procurement is a necessary and important function in the conduct of business. But there is an inherent tension in carrying out this mission. The Institute of Supply Management, an association of procurement professionals, asserts that its members must promote positive supplier and customer relationships while upholding one's fiduciary responsibilities and deliver value to one's employer, but do so without the appearance of unethical or compromising conduct. Spend enough time in business and you'll encounter an evil procurement manager. I have fond memories of the procurement manager who was hired several months after my team negotiated a mutually successful long-term agreement with our client. She called our accounts receivables clerk to demand assurances that the contract would be abandoned in lieu of one more favorable to her employer, then threatened a lawsuit when the frightened clerk squeaked that she needed to speak to someone higher up the food chain. By the time I was engaged, the procurement manager was practically frothing at the mouth, spouting sobriquets like "But you have to do what I say, I'm the customer!" We were sure to carefully document our conversations for future use when, as sure as night follows day, she proudly announced to her superiors that she had won concessions that we hadn't even discussed let alone agreed to. "I'm not singling you out, you understand" was her explanation, "My job is to reduce our vendor costs no matter what it takes." Therein lies the challenge. This procurement manager did not have a full understanding of the total cost of ownership. As we've written in this space previously, the cost to an organization for any product or service is more than merely the price tag. Selecting Product A because it has a lower sticker price than Product B is hardly a wise choice if Product A is incompatible with our existing systems and therefore incurs significant customization to function effectively. Likewise, a lawyer charging $425 per hour but who has a terrible track record of staying on budget may be a worse bargain than the lawyer charging $650 per hour but whose budgeting capabilities are precise. And one must consider switching costs too. If I hire a plumber to fix a major leak from my hot water heater, and in a fit of pique over high costs I fire the plumber while the parts are scattered across the floor, the leak will continue to generate costs in the form of water damage while I seek a replacement plumber at a fraction of the cost. Changing lawyers mid-trial, relocating your office across town to save a few dollars per square foot and scrapping a software implementation after a significant investment in training in order to find a lower per seat license cost are examples of business decisions that run the risk of emphasizing price tag shopping over the total cost of ownership, if we don't fully think through the implications and downstream impacts of our decisions. In our above anecdote, the procurement manager demonstrated no understanding of the concept and therefore damaged valuable business relationships in her quest to save a few dollars. If your supplier is fungible, damage away. If you may need that supplier again, take a long-term view. Those who sell services which aren't commodities, or at least those who aren't willing to admit they sell commodities, fear the procurement manager who reduces all potential suppliers to the lowest common denominator -- namely price -- without understanding the context. But many service providers are lazy and unhelpful in demonstrating why their services are different and therefore more costly than the alternatives. A well-trained procurement manager will seek to unpack the value in an offering. For most products and services offered in a moderately efficient market, there will be a base cost to deliver services below which no supplier can reasonably sell its product and still make a sustainable profit. And in most competitive markets, there isn't wide disparity in profit margins between competitors. So if we can assume that within reason everyone can make and sell the same product for roughly the same cost, then why are there differences in price? This is the procurement manager's quest -- to understand and quantify these differences without the undue influence of past relationships or conventional wisdom. Just the facts, ma'am. In this visual, we see the base cost. A good procurement manager can even identify the increased cost of a comfort brand. In many lines of business there's that one reference point, a supplier at the high end of the food chain, one whose prices are higher but whose reputation is impeccable, so that if I purchase from them, I'm immune from criticism for making a poor choice of suppliers. Let's call that the "brand safety" factor. There's no shame in acknowledging that sometimes we make safe purchases and that we pay extra for that safety. What remains is an "X" factor, or an unexplained difference between the costs of two apparent substitutes. A good procurement manager will seek to explain and potentially reduce this difference, first by ensuring that the product offers what is needed and not more, nor less. This is the true function of an RFP (a request for proposal), to ensure an apples to apples comparison of alternatives. Absent clear guidance on what is needed, it's a challenge to compare alternatives. A favorite tactic of some former colleagues of mine who should be elected to the Sales Hall of Shame is to "throw in" as many unnecessary items as possible, allowing them to reflect a much higher starting cost and then apply discount after discount to achieve what appears to be a compelling and substantial "effective discount" off list price. In the end the customer may get what he wants but at a higher price, and by the way he wins a lot of crap he doesn't need. 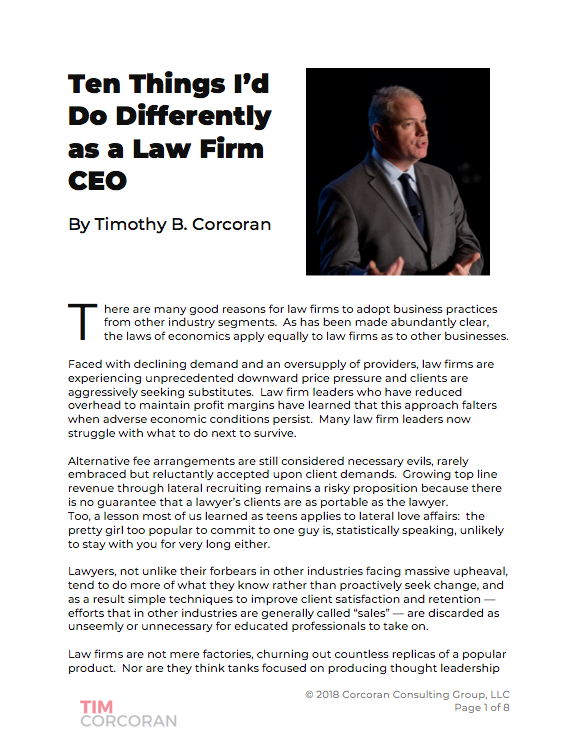 A law firm that can demonstrate its prowess in managing to a budget through effective project management, that keeps the client fully informed of any changes to expectations, that staffs appropriately and doesn't "overwork" matters or expect clients to subsidize young associate training, is in a better position to present clear, quantifiable evidence of its higher rates. A software vendor that has documented compatibilitywith existing legacy systems, thereby keeping integration costs down, may have a strong case for higher license fees. In each case, the approach reduces total cost of ownership. Those sellers who have the most to fear are those whose price points cannot be reasonably be justified, or quantified by an independent outsider. It's not enough that my CEO and your managing partner are golf buddies. It's not enough that we've done business for a long time. If I cannot unpack why your rates are significantly higher than some apparent substitutes, and you can't articulate it either, then I'm compelled to explore alternatives. But let's not kid ourselves. We sometimes forget these principles when looking at our own cost structures. It's a sad but not uncommon situation that large buyers will squeeze their defenseless suppliers. Some years ago I hired a consultant to handle a project when the internal resource dedicated to the task resigned abruptly. I had moved on by the time the project was complete, but I learned that my former law firm employer gave the consultant a 60 cents on the dollar take-it-or-leave-it offer to settle the final invoice. The law firm's procurement manager reportedly dimissed the injustice: "We're a global law firm. What are you going to do, sue us?" The sad irony is that the law firm took this action as part of a massive cost-reduction effort, initiated in part because its own corporate clients were spending less, at the recommendation of the corporate procurement managers. Justice served? Or just a sad cycle of frustration? When your organization comes up against a procurement manager, this is a good opportunity for some self-examination. Are we able to articulate why our costs are higher than our competitors? If not, why not? Rather than assume our competitors are using predatory or lowball pricing to steal work away, is it possible that we've failed to recognize the inexorable march to commoditization of our products and services? Do we assume our brand carries with it more prestige and "safety" than the market? Maybe our competitors have devised some innovative ways to deliver more for less. Their lower pricing may reflect this innovation, suggesting they can remain profitable at a lower price point. And yet we assume they're losing money because we can't offer similar savings. When hiring a procurement manager, focus them on total cost of ownership. Saving pennies on discrete costs is fine, so long as the impact of these choices doesn't result in higher fees over the long run. In organizations with many silos, a procurement manager may be in a unique position to recognize opportunities to consolidate services, to seek lower-cost alternatives, to adjust business practices to save money. This means they put a spotlight on us as well, and not just on our pencil vendor. If we're serious about controlling costs, it has to start with us. If you're a procurement manager, please stop issuing RFPs asking 127 questions for which you have not a clue what you'll do with the responses to 120 of them. Be clear that your role is to maintain positive business relationships with valued suppliers, but help identify those whose costs are not aligned with the value delivered. Times change, prices increase, needs fall out of synch with what's sold, but except in a few cases the sellers aren't charlatans and the buyers aren't ignorant weasels trying to extort kickbacks. Shine the light of day on the commerce of your business and start with those areas which are most easily recognizable as commodities. As your colleagues begin to trust your process, you can then move on to the more sensitive areas, where we business managers tend to protect our turf. Let's all be prepared to take our medicine. For some of us, the increased use of procurement managers may be a miracle cure leading to lower costs and new business opportunities. For others, well, the cure may end up killing us.